The human game is a cat-and-mouse, gotcha! game with a who’s right/wrong, win/lose system, and bad results. The results (good or bad) will prove your kind of game. In sports, we have the player (human) and the coach (being). The problems arise when the player (human) wants to be both player and coach. We have the best life coach within us, the being (spirit-God). The most popular game in town, the Gotcha Game! (I am right, and you’re wrong) (I win, and you lose) Ha! Ha!  Choose hot topics that will make a difference.  Give quick info about who you are and how to play the game of life.  Spend more time on the hot topics applying the concept of S.I.U., making the show funnier and easier to get the message, less lecturing and boring.  Make these two characters, the human and the being, talk to one another by expressing their thinking and behavior aloud.  Open as if they really are two separate identities in one person, which is really true in real life. It’s thinking aloud to yourself, arguing with yourself, trying to make sense and /or trying to come to a decision, and how to live it with all the lies and violence that the human creates and does to oneself and others through the word of love you, I care, etc.  Must show how these two characters, identities, come together and play together in the right position, the human and the being, the player and the coach, showing the importance of both to each other, bringing peace, harmony, and happiness to one another, to others, and naturally to life as a whole.  There is the dialogue going on in our heads be- tween the human and the being with us all the time. Make it funny and loud. It’s a piece of cake! Talk for the audience. Do and say it for the audience’s therapy.  Like they do in wrestle mania and/or stand-up comedians. Here we have two guys talking for one, which at the end is one guy talking and living at peace for two. It starts with two guys and ends with one at peace, amen. Perfect example of a sport game application to life, win – lose and right – wrong, played by the human in everyday life causing most of its problems. Make a team of the six personalities and make a team out of the human and the being by each knowing their positions. The being = the coach – coaching and letting the hu- man know it and stopping it from making decisions. Boo-boos – the human doing whatever it feels like and trying to get away with it. The human must know that it’s paying the consequences. It must be out in the open. The player plays, and the coach coaches, and that’s it! Being: (anger with laughter) Play nice! Why can’t you play nice? Human: I don’t know why! I can’t explain it! I guess that’s the way I am. I can’t help it. This is the way I was born. I am only human. Being: Oh! Really? You are so smart that you outsmart yourself and so good at it that you don’t even know it, even when your peace of mind is gone, you still insist that it’s not your fault! Isn’t that incredible? You’re not just a human, you are also a being that’s me. Remember me? I am your coach, your life’s coach. I am here. Use me. Ask me. That’s my job. That’s my purpose. Human: I don’t know. I don’t know. Being: That’s an excuse. Ask me. You don’t know? But, I know! So, ask me. For God’s sake! For your sake and mine, don’t play the part of the big shot, the know it all. That’s not your job. Your job is to play. My job is to show you how to play in order for you to be happy. Is that so bad? Is that too much to ask? Isn’t that what you want? Being happy? That’s what you say, “I want to be happy! I want to be happy!” Then, you drive yourself crazy. I really think that sometimes, or most of the time, you are crazy and drive everyone else crazy! If other people would do to you what you do to yourself, you would kill them. Yet, you do it to yourself and think nothing of it, and that’s okay! I mean, really, does this make sense to you? Human: I am confused. I am stupid! Being: You’re not confused. You’re not stupid that’s how you feel. Feel confused. Feel stupid. Being: You’re not who you think you are. I am sad. I am angry. I am sick. I am stupid, and all that stuff. That is how you feel and feelings can be changed, fixed. You feel sick, feel sad, feel angry, or feel stupid. Who you really are is a perfect spiritual being having a human experience called life. After I am, must follow “a perfect spiritual being” always. Human: Oh sure, sure, it’s easy for you to say that. It’s not that easy for me! You don’t know me. Being: Yes, I do. I do know you! I have been with you since you were born and before. I have been watching what you are doing to yourself and to others, committing mental and physical violence, and it’s time to stop it once and for all, enough is enough, before you destroy yourself and others completely, so again, you are outsmarting yourself, and you are paying the price. I am not waiting till then. It’s too late! Human: Okay! Okay! I guess you are right! Being: You guess! You guess! This is not about guessing and not about being right. It’s about being happy, about really living with joy and peace. What is wrong with you? You think of one thing and you say something else and do something completely different and then complain that you’re not happy, you’re not lucky, and all that stuff to get yourself off the hook. Human: All along is saying “But, but, but,” trying to stop the being from continuing talking. Being: But nothing. Just listen. I’ve had it with you, or I am leaving. I told you that before, and if I do, you know what happens, don’t you? You’re dead, dead right! That’s one time that you’re really right. Dead right. Finished. Kaput. Finito. And, remember I don’t really need you. I can go to someone else that listens to me. Human: Hey! Where did you get that sense of humor? Being: To put up with your craziness, I have to have good sense of humor, or off with your head! You’re lucky that I have this sense of humor! Human: That’s not so funny you know. My new and updated book, “How to Stop the Human Bully” is now available for download at Barnes & Noble. 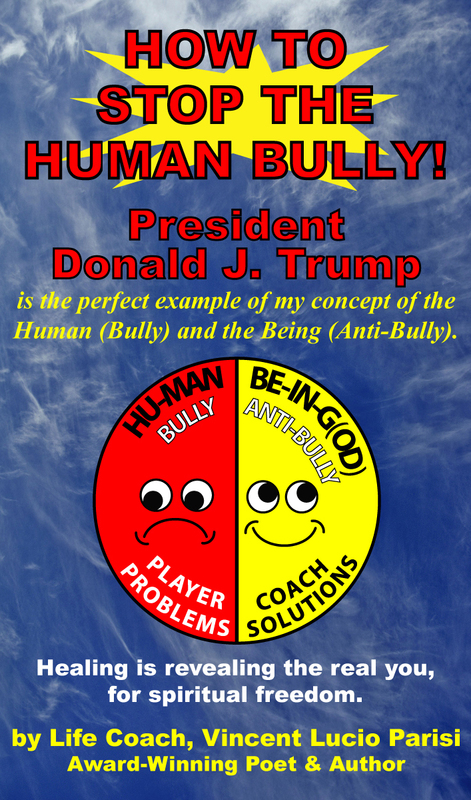 Donald J. Trump is the perfect example of my concept of the Human (Bully) and the Being (Anti-Bully).